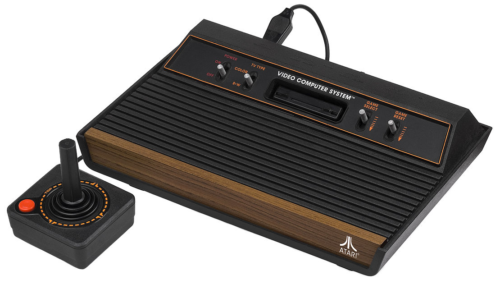 Shortly before everything went belly-up in 1983, the nascent computer game industry was enjoying something of a boom in the early Eighties, with Atari at the very vanguard. To accompany the exciting UK launch of the “Pele’s Soccer” game on their new 2600 console, Atari got ageing comedy duo Eric Morecambe and Ernie Wise on board to star in one of their “Have You Played Atari Today?” television adverts. As you can just about tell, Pele’s Soccer doesn’t really hold up by today’s gaming standards, but it was notable for being the first football game to allow players to control their goalkeeper. The Atari 2600 was pretty revolutionary too. It was originally launched with just nine game cartidges, but the catalogue eventually grew to include hundreds of different titles – some more successful than others. The two-dimensional action is hardly on par with FIFA 19, but then it is almost 40 years older than EA Sports’ latest franchise instalment.